Have a Happy Halloween - from The Sock Review! It was a dark and stormy night down Eerie Street. The rain pelted my hat as I ran into the deserted house, hidden behind the fall-bitten trees. I was lost - my socks were soaked, and I had no recollection of how I ended up here. Great...no reception; I had to try. But what was this place? At least it was dry inside - except for the "plu-ep, plu-ep" of desperate rain drops, driving their way into the cracks through neglected roofing and hanging from the ceiling like bats. "Come on..." I thought...my pace quickening as I reached for a light. No luck; this place hasn't had electricity for ages, I'm sure of it. What happened next, I can never tell...for on that very floor I fell. ***(But at least I was wearing amazing socks!!!) Happy Halloween, friends! *** We hope you enjoyed our little fun here on today's post! 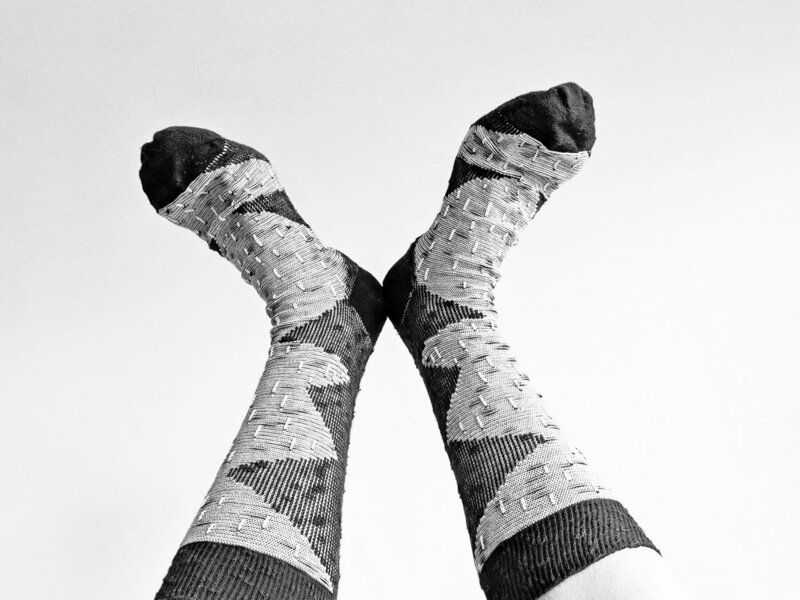 XOXO - The Ghosts & Ghouls @ The Sock Review! As a designer, sometimes I just want to draw. No limits, as they say; without any other purpose than to exercise my imagination and artistic inclinations. Sometimes, there is no end use for the things I draw, just a composition that I've worked out. Sometimes, though vague, those "out there" ideas turn into full-fledged concepts that require quite a bit of technical thought. But today, I just wanted to draw some crazy socks. My favorite sketching tool is a black Paper Mate® Porous Point Flair Pen. On that note - if you're looking for some great cozy socks that will keep your toes toasty and your wardrobe happy, check out some of my recommendations below. Life is Good has a great selection of cozy socks & slippers. L.L. Bean sells some different styles, including fleece cut-and-sew socks. Wigwam has got some excellent options for those who may even want to venture outdoors in the snow. Happy Snow Day @ The Sock Review! Check us out on Instagram.